Pie is my favorite food group. In my book, it really can be a breakfast, lunch or dinner entree for me or not JUST a dessert. 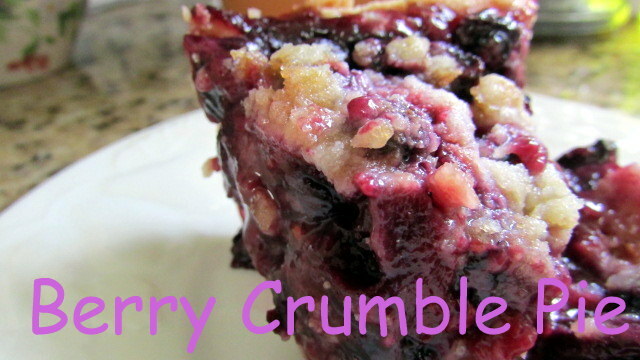 Berry Pie is my ultimate weakness…. I can be full after eating an eight course meal and a berry pie is offered as a dessert, no problem, there is always space available in my tummy. Ii seemed like a good idea to bake even though it was 90 degrees outside. But inside we had the AC at 65 degrees, perfect for baking. Before I arrived in LA, Susan bought all of the baking supplies known to man. Susan requested Crispy Thin Chocolate Chip Cookies and Arthur requested a PIE. Since we had a plethora of blueberries, raspberries and blackberries….a bountiful creation was in the making. 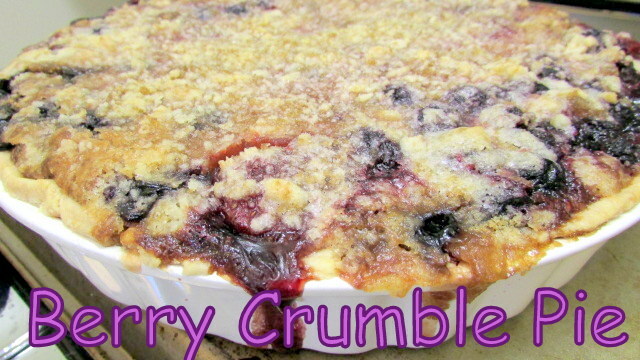 I just had a facebook party inviting all food bloggers to share their favorite berry recipes on my Moore or Less Cooking Facebook Page and Who Needs a Cape shared her delightful Blueberry Crumble Pie. Some recipes just stop me in my tracks and I need to make them ASAP. This was one of them! Since I had a limited amount of blueberries and enough of every other kind of berry in the freezer, it was full speed ahead! Arthur couldn’t wait for the pie cool, who am I kidding, neither could I. We each had a slice and then the MMMMMMMMM sounds just wouldn’t quit. We even gave a slice to the sweetest mailman Ray, it made his day. So this turned out to be our breakfast the next day, and a snack, and a dessert. Neighbors stopped by and they were given pie, everyone was in pie heaven….. 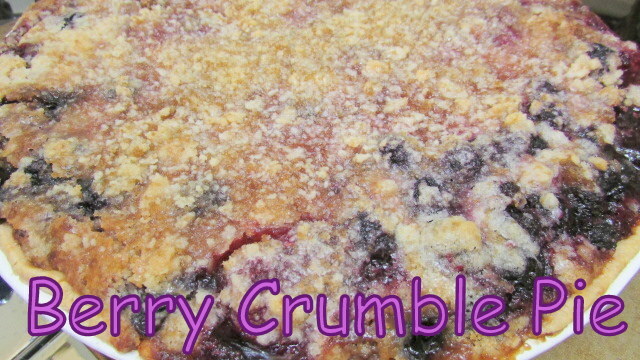 The perfect balance of sweet and tart with a delicious crumble. I used a Trader Joe’s Pie Crust, it was perfectly flaky and tasted like homemade. 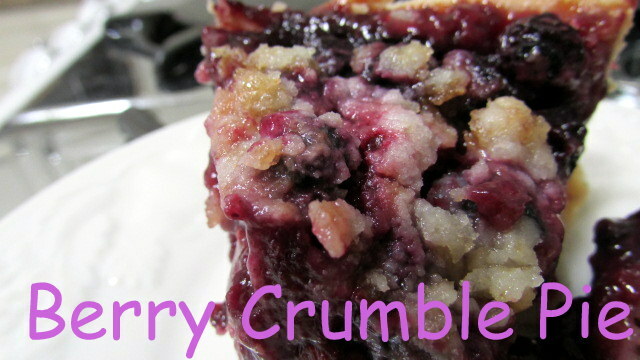 I like to use a crust for crumbles, it kind of holds it all together when serving, but if you don’t feel like baking one, it will still be delicious! In a bowl, mix berries with lemon juice, vanilla, 1/2 cup flour, 1/2 cup brown sugar and 1/2 granulated sugar, set aside. Use a fork, two knives or pastry cutter to mix together ingredients for crumble; butter, 1/2 cup flour, 1/2 cup brown sugar and 1/2 cup granulated sugar. 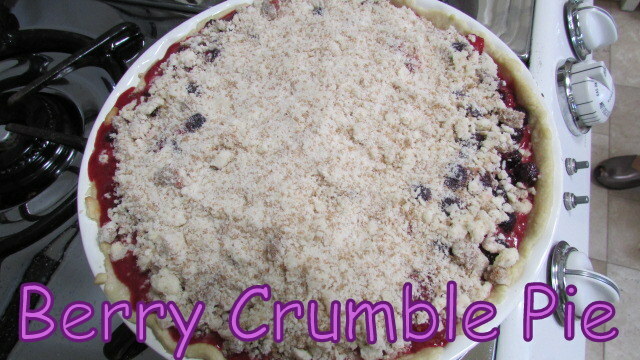 Add the extra flour to the crumble mixture until it is completely mixed and crumbly. Roll out pie crust into a 9 inch pie pan, flute the edges. Cover the berries with the crumble mixture. Let pie cool before serving, it makes it much easier to serve. This post made. Me so happy and so nostalgic. I miss you sweet girl, you are the best! I also can eat pie for any meal. Love this! This sounds fantastic Nettie. I have never made a berry tart before . This will be on my list of things to make.